With permission, Mr Speaker, I wish to make a statement on the development of higher education. The Government have now considered the recommendations of the Robbins Committee for the expansion of teacher training places, the creation of new universities, and the designation of Special Institutions for Scientific and Technological Education and Research. 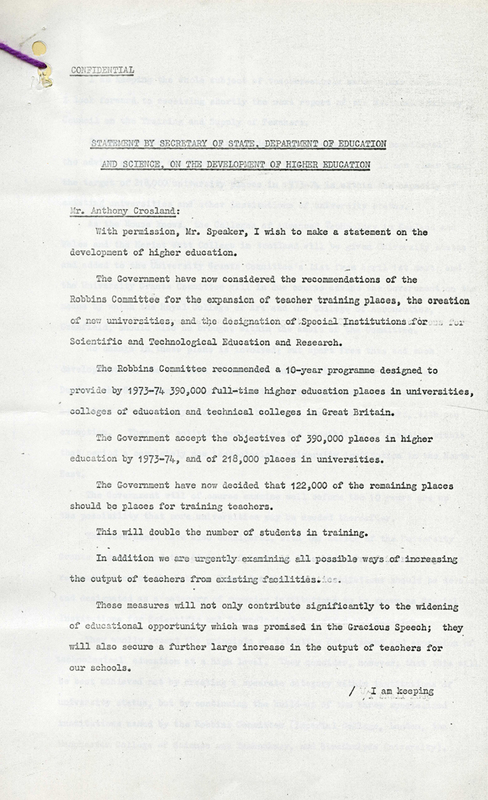 The Robbins Committee recommended a 10-year programme designed to provide by 1973-74, 390,000 full-time higher education places in universities, colleges of education and technical colleges in Great Britain. The Government accept the objectives of 390,000 places in higher education by 1973-74, and of 218,000 places in universities. The Government have now decided that 122,000 of the remaining places should be places for training teachers. This will double the number of students in training. In addition we are urgently examining the output of teachers from existing facilities. These measures will not only contribute significantly to the widening of educational opportunity which was promised in the Gracious Speech; they will also secure a further large increase in the output of teachers for our schools.